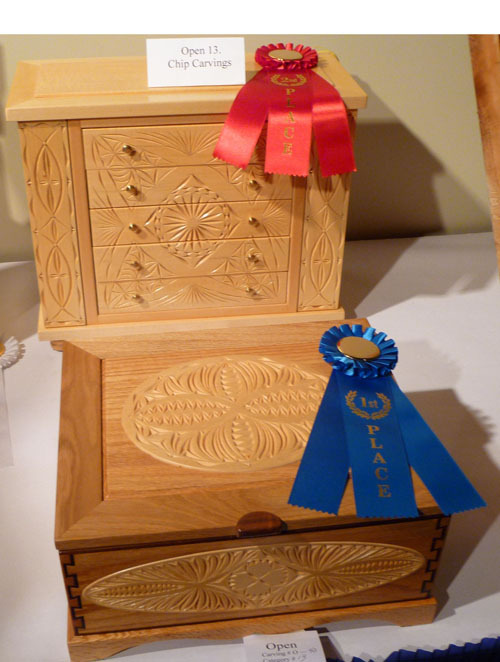 Congratulations to Highland Woodworking’s own chip carving instructor, Mickey Hudspeth, who just got back from the Smoky Mountain Woodcarving Festival, where he took 1st and 2nd places in the chip carving category. Mickey’s chip carving work has already been awarded numerous times, including the same festival in 2010, where he received first, second and third places in the category for his submitted works. We are proud to have such a renowned expert teaching our Chip Carving class here at Highland – if you want to learn from the best, sign up for Mickey’s Introduction to Chip Carving Class on December 3rd! The Wood Whisperer Rocking Horse Charity Build: Saddle Up! From the Chair-man: Sculptured Rocker on Display at Highland!